If you are ordering contact lenses online, you will need to know your contact lens prescription, or more accurately, your contact lens specifications. Do not attempt to order contact lenses based on your eyeglass prescription. There are a number of ways these specifications may differ. So always use the specifications that you get when you have been fitted with contact lenses. Your contact lens specifications consist of a number of different parameters, depending on your prescription and what type of contact lens you are wearing. You will need to know all of these specifications from your optometrist or optician. You may also duplicate the information from your current contact lens box tops. We caution you to always duplicate exactly what you have been wearing, or are given from your eye care professional. If you do not, you may find that our are not happy with what you receive. If you have astigmatism, you will need additional information from your contact lens prescription. As with a standard prescription, you will need your brand, base curve, diameter and power. axis Can be 10 degree steps from 10 to 180 but may be more or less depending on the lens. These numbers must come from contact lens specifications, please do not try to enter your eyeglass prescription. Contact lens axis and cylinder only come in certain ranges. Example: Your cylinder on your eyeglass rx may be -1.00 but when you try to order your contact lenses, you see that only -0.75 or -1.00 is available. Which do you use? This is why you must get these number from your eye care professional. Add power: this could be a power like +2.00, or simply low, medium or high. Possibly D or N, depending of the type of contact lens. The differences for the examples above are due to differences in the way the manufacturers make and label their lenses. This is a summary of the contact lens specifications needed from your eye care professional to order contact lenses online. You must also determine the number of contact lenses you want to purchase. Usually when ordering online, the more boxes you purchase, the better deal you will get per box. Johnson & Johnson also carries 24 packs in Oasys. One 24 pack equals a 6 month supply if your eyes are the same strength. 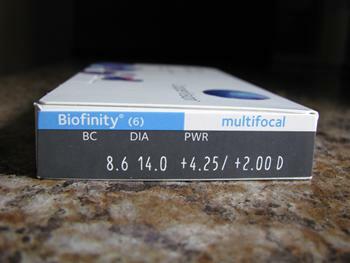 Two week and monthly disposable contacts typically come in 6 packs, in other words 6 lenses per box. Most people need a minimum of two boxes, unless your eyes are the same strength. 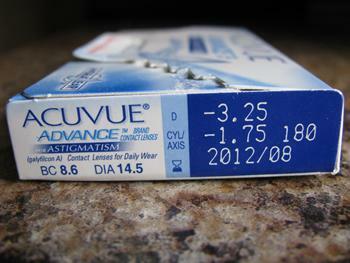 Daily disposable contact lenses are usually packaged in either 30 or 90 packs. Sometimes if the brand is very new or not as popular, only 30 packs are available. 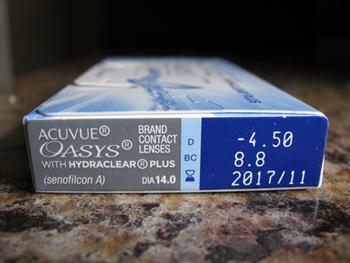 Yearly lenses are generally packaged in vials, and come in one lens per vial. That should cover all the different possibilities that you might need to know to order contact lenses online.